Bangkok is the capital of Thailand and the street food capital of the world! Known for its Michelin-starred street food and some of the world’s best restaurants. I have gathered all my Bangkok recommendations in this foodie map. You’ll find coffee shops, shophouse eateries, simple street food, as well as fine dining restaurants. Navigate the map easily either by scrolling through the list on the right or by clicking the points on the map. Places are listed in a geographical order. Gaggan has been voted Asia's best restaurant for the last four consecutive years (2014-2018), and currently is the world's 5th best restaurant (on the World's 50 Best-list). When the Michelin Guide launched in Bangkok, Thailand, in November 2017, the progressive Indian fine dining restaurant was awarded two Michelin-stars. Chef Gaggan Anand is world-acclaimed for the way he dared to challenge the deeply-rooted traditions of the Indian kitchen. Gaa is a Nordic-inspired fine dining restaurant using local Thai produce mixed with Indian flavors. Head chef Garima Arora was born in Mumbai in India and has worked several years at the acclaimed restaurant Noma in Copenhagen in Denmark before she served as the sous chef of Gaggan Anand. Her diverse background has made a deep impact on her cooking. Ramen Tei is chef Gaggan Anand's favorite ramen shop in Bangkok. Specifically, the original one situated near Silom Road, between two questionable massage parlors, which dates back to 1983 (today, they have four more branches). Order Tonkotsu Chili Ramen (spicy pork bone noodle soup, THB 240), Wantan Gyoza (potstickers, THB 130), Tori Cheese Age (deep-fried chicken and cheese, THB 200), Tori Karaage (deep-fried chicken, THB 180), and Butakakuni (braised pork belly, THB 220). Restaurant Sühring is something as rare as a German fine dining restaurant located in the heart of Bangkok. The two identical twins, Mathias and Thomas Sühring, got one-Michelin-star in November 2017 and made it to the no. 54 spot on the World's 50 Best Restaurants-list in 2018. Their style of cooking is playful, with one dish featuring a miniature-size serving of currywurst paired with a beer from a mini mug. Raan Jay Fai means the restaurant of Sister Mole, or Supinya Junsuta as her real name is, known for always sporting giant ski goggles and ruby red lipstick as she cooks up some of the most amazing Thai dishes. 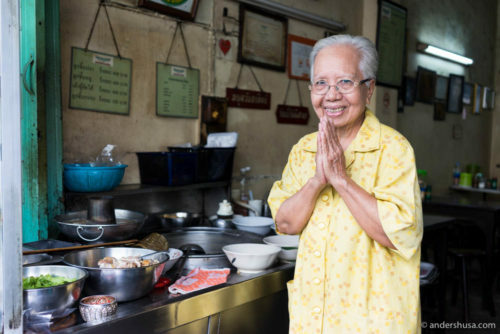 She is the street food queen of Bangkok, and her drunken noodles and the THB 1000 crab omelet are legendary. The shophouse eatery was awarded one Michelin-star in 2017. Thai Tham Pig Brain Soup (Samong Moo) opened in 1957 (!) and is still today a whole-in-the-wall shophouse eatery serving mainly one dish. You guessed it – pig's brain soup. A favorite among locals, but not as big of a secret as it used to be with more and more tourists finding their way to the Phraeng Phuthon neighborhood (Chinatown) these days. If you think a pig's brain soup has big chunks of mushy brain meat floating around in it, you are absolutely correct. Udom Potchana is a more than 80-years-old restaurant in the Phraeng Phuthon neighbourhood (Chinatown). One of their specialties is fresh egg plant rolls served with Chinese mustard. Krua Apsorn is a casual heritage restaurant with two locations in Bangkok dedicated to serving classic Thai dishes. The original is located in the Dusit district and has a Bib Gourmand rating, but we visited the equally well-known one on Dinso Road. Legend has it that the Thai Royal family considered these among their favorites. On the menu, I most enjoyed the tempura prawns (THB 180), stir-fried Chinese broccoli with roasted pork (THB 120), and stir-fried crab meat in yellow curry powder (THB 500). Khua Kling Pak Sod is a family-run casual neighborhood restaurant in the Prasanmit district in Bangkok that mostly caters to locals. The kitchen is lead by a 72-years-old aunt who's recipes are based on the traditions of Southern Thailand, known for its particularly spicy and acidic food. This is the family's second location, created because of the intense traffic jams in Bangkok, and was awarded a Bib Gourmand in the Michelin Guide. Some of my favorites on the menu were Goong Makam (spicy tamarind tiger prawns) and Nua Pu Pad Pong Karee (crab in yellow curry powder). Uncle Moustache ( หนวดเจ้าเก่า) is a place that I'm not sure I will ever find again. The placement on the map is your best bet at tracking it down. The English name I have suggested is a loose translation, but it won't say that above the door. Gaggan Anand brought us here for late night snack of indigenous Thai food. My favorite was the escamoles (ant's egg) and the giant prawns with a super spicy sauce. Kyobar is a counter-seat restaurant, located within the Siam Paragon mall, dedicated to serving only desserts. The concept draws much inspiration from Japanese culture, especially Kyoto (hence the name), and the multi-course kaiseki meals. Operated by chef Dej Kewkacha and his brother Litti, who, under the brand Kacha Bros, own and run several restaurants around town. Among them Teraoka Gyoza. Teraoka Gyoza was Thailand's first specialty gyoza restaurant. The izakaya-style casual eatery is owned by the Kacha Bros in cooperation with seven-time Gyoza Champion Teraoka Yuichi. Don't go here without ordering the no. 1 signature dish – the Mentai-Cheese Gyoza. Steamed and fried chicken gyoza dressed with Mentaiko cod-roe and sizzling melted cheese. The Yuzu Shoyu Ramen is another can't miss. Brave Roasters is one of the best coffee shops in Bangkok if you are craving the more light-roasted and flavorful third-wave-style of coffee. Brave even roast their own brand of coffee with beans from Thailand! You find it on the 3d floor of the Siam Discovery mall, co-located together with the I+D Style café and handicraft store. Thai Niyom Cuisine is one of three restaurant concepts by the San Francisco chef Billy Bautista and his wife and business partner Oh Laopanich. While their two other eateries bring Spanish and Mexican cuisine to the city, Thai Niyom is based on typical Thai comfort food. Don't miss their spicy Thai sausages – they are a killer. Hands & Heart Coffee is a specialty coffee shop in a quiet corner of Bangkok. The cozy café is a hidden gem in the concrete jungle. Beautiful minimalistic design, both the exterior and the interior, with white-walls, white marble tables, and a contrasting black marble coffee counter.